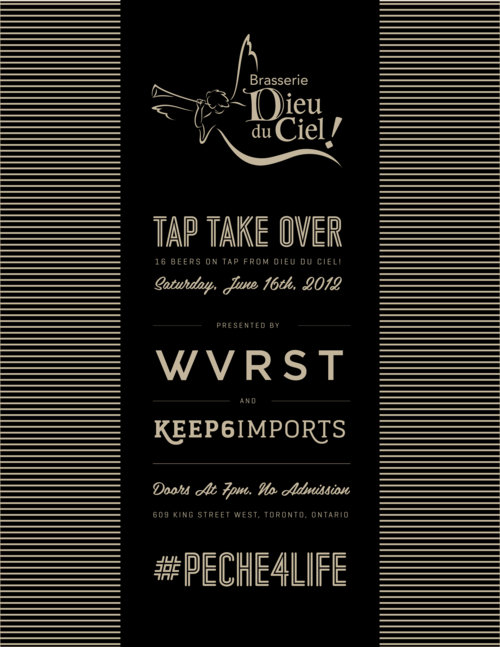 It is with great pleasure to bring you 16 beers on tap from Brasserie Dieu Du Ciel! (St-Jerome/Montreal, Quebec) at WVRST BEER HALL on Saturday, June 16th, 2012 (7:00pm). Prepared by WVRST…21 different types of Artisan Sausages with a large variety of Game Sausage, and the famous Danger Dog - an all Beef Hot Dog wrapped in house cured Bacon and roasted with love.DUCK FAT FRIES - home cut Belgian Style Frites with a choice of home made dipping sauces. Dieu Du Ciel! will bring the beer and the beats to this event. Several representatives from the brewery will be present!